My wonderful journey of life with a Kerry Blue started on May 30, 2009, when I picked up my puppy from the breeder, Youlia Anderson (PennTerra’s KBT). Since I am already active in performance events with my Rottweiler, I knew this puppy would also be participating in activities when she got older. I love doing sports with my dogs where their breed isn’t the typical breed you see participating. I do weight pulling with my Rottie boy, and Bean is also a weight pull dog in training. I decided to look for another sport where Bean might also be the first in her breed to be titled, so I looked into dock jumping. With the Kerry being the all around working and retrieving dog for the farmer, I thought this would be a good fit. I contacted the local club, Keystone DockDogs, because I wanted the proper introduction and foundation work. I knew I’d be competing with Bean. I was told there was a member, who put some time in at a nearby dog pool who would help with newbies in the sport, and I was put in contact with him. He was excited to see a Kerry getting involved, as he had never seen one competing. If one does not have access to a pool, a lake or beach will work equally well, since the first step is teaching them to swim. When I arrived for the first time at the pool, the Keystone member told me that the first visit was just for a positive experience with no pressure. I put a life vest on Bean and let her run around and play. Even just standing in the water was praised, and nothing was rushed. It must be FUN for the dog. In the beginning, it’s just play, play, play. Place the toy in front of them and give them LOTS of praise if they pick it up. As they get more comfortable in the water and with their toy, tossing it a little farther will eventually have them retrieving it. As the toy gets farther out, the dog tends to rush in the water with some splashing in the excitement to get the toy. This is the start of teaching them that a splash is fun and part of the play. Pick one particular toy for this game, (and it is a game for the dog) and it is important that this toy is used for ONLY this game. By doing this, eventually the dog will get super excited just seeing the toy, because he knows what is about to happen. It then takes only a little “toy play” to get them revved up while in line at competition. Once Bean was swimming and retrieving, it was time to introduce her to the dock. It is very important not to rush them to jump off the dock; they have to want to jump. In competition, pushing, tugging, or yanking the dog is not allowed. So it is important that it not be done in the beginning to potentially shut them down. When I first attempted to ask Bean to jump, I engaged her with some play with her toy to rev her up. She chased it, jumped for it, and tugged on it, increasing her desire for the toy. We walked up to the end of the dock, and I dropped her toy right in front of the dock. You have to make the dog think that they can get it, and keeping the toy in close in the beginning increases the chances of them thinking they can do it. After I dropped it, I praised her if she looked at it with a “yes, good girl.” The more she acted interested in the toy, the more excited and encouraging I got. This is where revving them up is important. In the beginning, the encouragement of the splashing comes in VERY handy, because Bean went off the dock quite readily. If she hadn’t, I would have gone back to the other end of the pool, (or shoreline at a lake), and done a few retrieving games with some splashing repetitions. Once she jumped off the dock, I gradually threw the toy farther out. Bean was a VERY fast learner and in all, this process took about a month. I went to the pool about once a week and stayed about two hours. So now Bean was a dock jumper. Now what? Well, she was ready for a competition. It really is that simple. Dock jumping is a great sport in that there is very little training involved in order to compete. It’s not about training the swimming and retrieving or the dog having an abundance of energy. It’s about their DESIRE for their toy and tapping into that desire, (often called a “toy drive”). It’s not like agility, rally, or formal obedience; once they are jumping, you enter! Bean LOVES to play and LOVES her toys, so for me, it was easy from day one. She FLIES off the dock. However, no two dogs are alike and what is “easy” for one owner may not be “easy” for the next. This does NOT mean one is a better candidate than the other, and it is important to not get discouraged. It just means you have to take the steps a little slower. My Rottweiler, for example, thinks this jumping off the dock stuff is in no way fun. I need to work with him more on the shoreline, and his desire for his toy, (which he has, just not in the water). If you have a dog that needs more steps in the beginning, just take it slow. Train for the race, not the sprint. I chose to compete in DockDogs because they have regional events, as well as traveling nationally, and I can join a local club (Keystone DockDogs). However, UAD (and now SplashDogs), is partnered with UKC, and one can earn UKC jumping titles. So, I will compete in UAD in the near future. For DockDogs, a membership with DockDogs Worldwide is required to have the titles recorded, and the title goes with the team (handler and dog), not just the dog. For UAD, if you want it to earn UKC titles, you must submit your registration number when entering, but UAD does have their own titles. (Editors Note: The American Kennel Club recognizes titles earned at North American Diving Dogs events.(northamericadivingdogs.com)). The dock is 40 feet long, 8 feet wide, and 2 feet above the water surface. (This may vary slightly with each organization.) In DockDogs, the body of water can be either a pool or a lake at least 4 feet deep. The dock is covered in a turf type carpet for traction and safety. The team can use any amount of the dock they choose and can start from any point on the dock. For instance, with Bean’s first event I chose to keep her up close to the edge of the dock, and I only went back about 10 feet, so she kept her confidence. In her second event, I went back 20 feet. I knew she was a little more solid with her jumping and a little more used to the environment. The bigger more experienced dogs use the entire 40 feet. The competition is called a wave, with 2-3 waves per day and practice time in between. In each wave, you have two jumps with the longer of the two jumps being your official score. The jump is measured from the end of the dock to where the tail set enters the water. This way, all the dogs are judged fairly against each other. The handler has 90 seconds on the dock to work with the dog, which some people use to play with the dog and build up his energy. Green dogs sometimes need the time for extra encouragement, while others hardly need any time and just blast out a great jump. The top six dogs of each division move to the finals; so a jump of 8 or 9 feet could easily be in the Novice Finals. There is then an awards ceremony for the winners in each of the divisions. There are two techniques used in preparing the dog to jump. One is called “The Chase,” and the other is called the “Place and Send.” The Chase method is where the dog is placed at one end of the dock and the handler stands at the other end of the dock near the pool. The dog is released and the toy is thrown as the dog is about to jump, creating a jump with nice height and (hopefully) distance, because the dog follows the toy, trying to catch it. This method takes some mastering because timing is critical, and an “off” toss can affect the performance of the dog. The Place and Send method is where the dog and handler go up to the edge of the dock and the toy is thrown into the water. The dog is encouraged to see the toy in preparation to jump. The handler then takes the dog back to the desired point on the dock and releases him. Sometimes you will see the handler run with the dog for extra encouragement and excitement for the dog. I currently use the Place and Send with Bean because she is still young, still learning, and not solid on her sit/stay yet. I will be transitioning to The Chase, as we mature as a team. 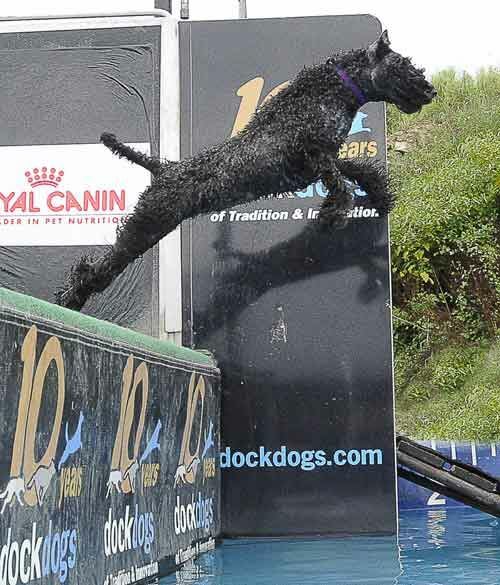 Dock jumping is a lot of fun for both you and the dog, and jumping with possibly the first titled Kerry Blue (in DockDogs) makes my experience even more special. I knew I wanted a Kerry “someday,” but it became a reality so much earlier than planned. It’s truly a magical connection when your dog picks you to be her owner. I still remember my heart melting seeing all those adorable puppies running around Youlia’s yard when I went to pick up Bean. At 17 months old, she’s still melting my heart. New York, NY -The American Kennel Club® (AKC®) will now recognize titles earned by dogs competing in events sanctioned by North America Diving Dogs (NADD), an independent governing body for canine dock diving. NADD offer two types of competition for all dogs — distance jumping and air retrieve. “NADD events are an exciting activity that can be enjoyed by all purebreds and mixed breeds. The AKC is pleased to now be able to acknowledge the achievements of all dogs in this sport,” said Doug Ljungren, AKC Vice President of Sports and Events. In the distance jumping competition, there are two classes — Open Class (any size dog welcome) and the Lap Class (for dogs under 16″ at the withers). A division title is earned by accumulating five qualifying jumps within one division. There are five divisions ranging from Novice to Elite. After earning the initial division title, dogs can earn Advanced and Excellent level titles by completing additional qualifying jumps. In the Air Retrieve competition, a dog and handler team earns one qualifying grab towards a division title based on their longest grab in the Air Retrieve. Like distance jumping, a division title is earned by accumulating five qualifying grabs within one division, and there are five divisions ranging from Novice to Elite. Additional Advanced and Excellent titles can be earned with additional qualifying grabs. Rules governing NADD events, the complete titling requirements and information about how to sign up to host a NADD event can be found at http://northamericadivingdogs.com/. Specifics about the NADD/AKC titling program and the AKC title application form can be found in the AKC Title Recognition Program section of the AKC website at http://www.akc.org/dog_shows_trials/titles/index.cfm.